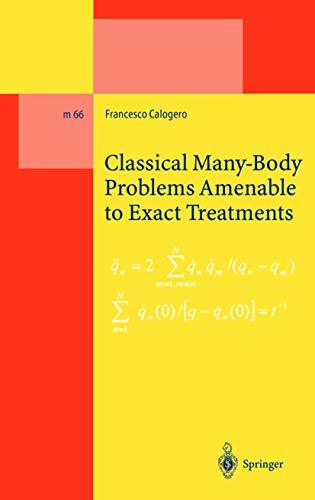 [PDF] Classical Many-Body Problems Amenable to Exact Treatments: (Solvable and/or Integrable and/or Linearizable...) in One-, Two- and Three-Dimensional Space (Lecture Notes in Physics Monographs) | Free eBooks Download - EBOOKEE! Description: This book focuses on exactly treatable classical (i.e. non-quantal non-relativistic) many-body problems, as described by Newton's equation of motion for mutually interacting point particles. Most of the material is based on the author's research and is published here for the first time in book form. One of the main novelties is the treatment of problems in two- and three-dimensional space. Many related techniques are presented, e.g. the theory of generalized Lagrangian-type interpolation in higher-dimensional spaces.This book is written for students as well as for researchers it works out detailed examples before going on to treat more general cases. Many results are presented via exercises, with clear hints pointing to their solutions. No comments for "[PDF] Classical Many-Body Problems Amenable to Exact Treatments: (Solvable and/or Integrable and/or Linearizable...) in One-, Two- and Three-Dimensional Space (Lecture Notes in Physics Monographs)".